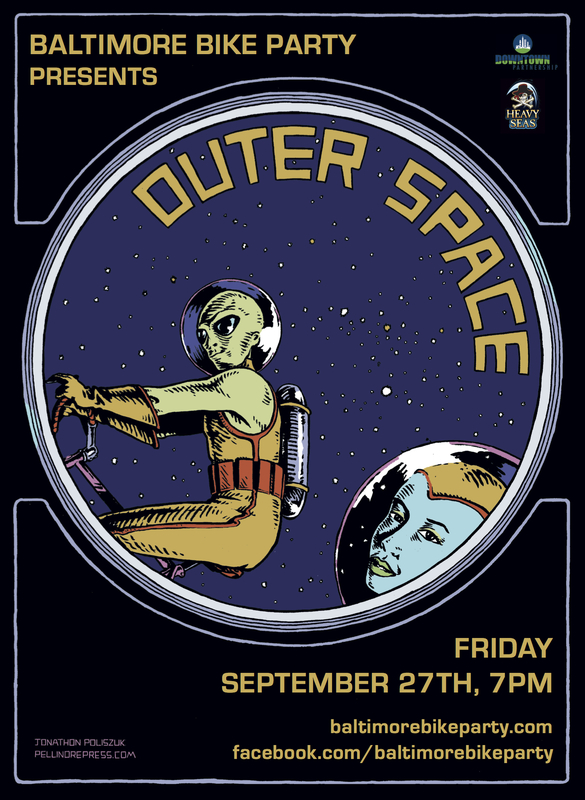 Baltimore Bike Party: OUTER SPACE!!! Grab your moon boots, phasers, light sabers, and little green friends for this month’s Bike Party! This month we will be meeting at ST. MARY’S PARK in Seton Hill! If we keep the park clean and stay out of the streets while congregating, there is a good chance this could be our new permanent home and no more of this getting jostled around! The after party will end at Hopkins Plaza downtown with food trucks, DJ Ro, the photo booth, and beer once again provided by Heavy Seas! We will have more updates soon, including the route, parking information, and other important stuff. I will tell you now that this month everything is looking pretty sweet so stay tuned for some good surprises coming up!